ikat bag: Expanding Bunnydom: tutorials in the works! 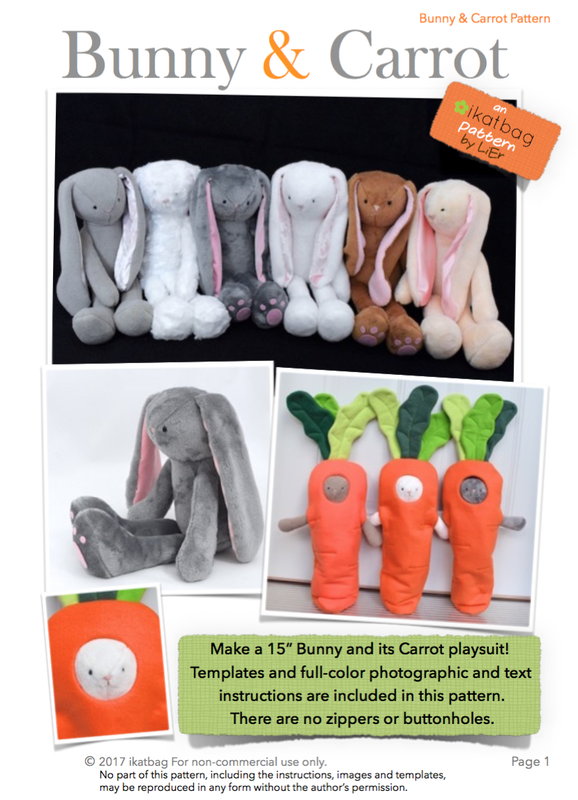 Thank you for buying my Bunny & Carrot pattern! Your support has been awesome and Kate and I are so excited to think of all the new Bunnies that are being made all over the world. Eeee! 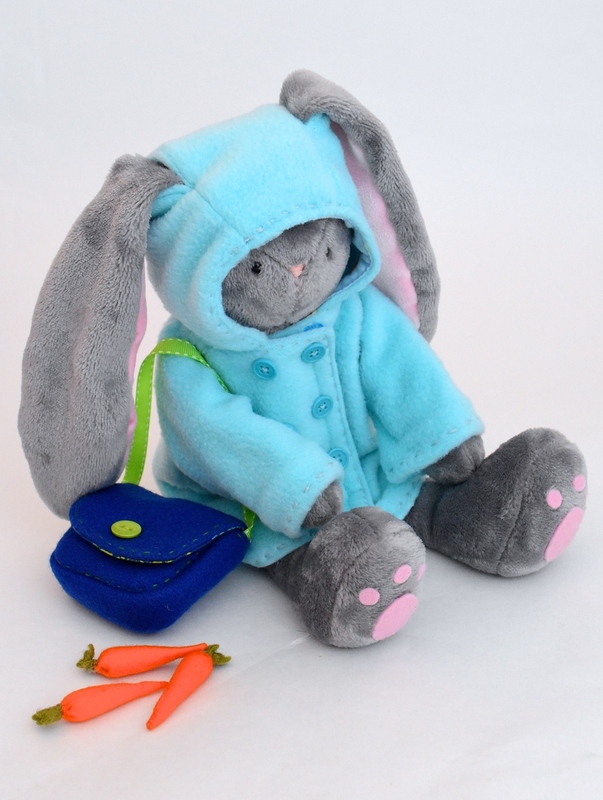 Because we love and appreciate you guys, look at what we've added to the wonderful world of Bunnydom - a hooded pea coat and a bag of carrots! This will be a free tutorial . . . well, TWO free tutorials - one for the bag and the other for the coat. The photos are all taken, and the samples all completed, so the plan is to get the tutorial out here on the blog in the coming week so you'll have plenty of time to make coats for any Christmas Bunnies who are going under the Christmas Tree. Also check out my etsy store - I've stocked it with limited quantities of Bunnies-&-Carrots, a couple of the little bags and some coats. They're all a little different, so please read the descriptions carefully (the photos will help). For instance, two of the coats have ear openings for the Bunny's ears to poke through, and two do not. Some of the Carrot playsuits are entirely fleece, and some are a combination of fleece and felt (look at the materials tags if the fabric is important to you). I'm typically very prompt in shipping (I pack and ship the same day I receive your payment) but I'm mindful of the holiday shipping rush and want to avoid any delays in getting your items to you. If possible, please use paypal because your payment clears instantly - with credit card/Etsy direct payment, it takes at least an additional day or two for the payment to clear and for Etsy to notify me that it's okay to ship. Finally, a reminder for those of you who have the 50% off discount code for the Bunny pattern - it expires on Jan 1st i.e. the last day to use it is Dec 31 2017. Oh I love this ! I have plans to make a second bunny, the first one went to a little friend for her first birthday, she loved it, especially the carrot. But now I have a sad almost 10-years-old boy who wanted his own bunny, and will be getting it for Christmas. I love the coat ! Aww... that coat is so cute! I will definitely need that, but not till after Christmas, since my bunny won't be in the works till later. "Plenty of time", she says! Haha! Our Bonny Bunny(as she's known here) is pretty excited for the coat as it has been snowing here and only her own fur is to cold. And she loves that bag. I love the jacket! Super cute.